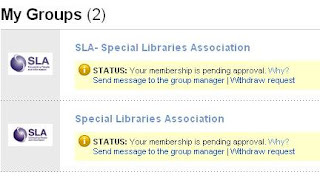 I was perusing the library groups on LinkedIn today, and I found that SLA has a number of groups posted. There are some chapter groups, but there are two groups that, according to their headings, look like they are the national organization. Now, one can quickly determine which is the "official" group and which one is not by the description. However, the unofficial group is first in rank (by searching "libraries"), and it has more members. Interesting. Is this because it is a more open group and not just a means by the SLA's marketing to have an outpost in Web 2.0 land? Or is it because it is ranked first (and how does LinkedIn rank?). So many question, so little time. Organizations and their brands can easily be co-opted in our brave new world. Making sure your brand has it presence in this multi-channel, everybody-and-their-brother-has-a-social-site world is imperative. And if you were late to the party? Well, if that whipper-snapper isn't acerbic like the infamous Perez Hilton, it's better to join 'em. Once you've lost control, it's almost impossible to get it back.